TS Eamcet Results 2019 - Telangana State Council of Higher Education(TSCHE) students, good news to all of you Telangana Eamcet Results 2019 will be declared 19th May 2019 by Manabadi.com after official release by TSCHE, JNTU Hyderabad, Telangana State .and also available at Manabadi Results. 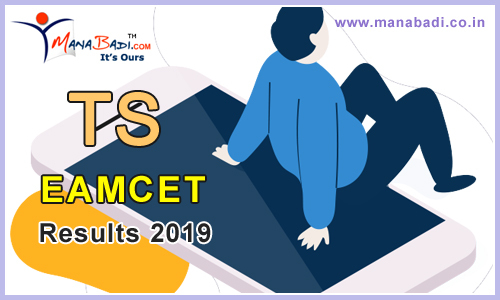 Here we will update your Eamcet Result 2019 so you can check your TS Eamcet Result 2019 online, after result announcement. So keep patience and check here for getting latest information regarding result. In this article We are giving the full information about TS EAMCET 2019 results,cutoff marks, rank card and counseling . All arrangements have been made for smooth conduct of Telangana State Engineering, Agriculture and Medical Common Entrance Test (TS-Eamcet) 2019 through Computer Based Test (CBT) mode for the first time in the State. The entrance test for AM stream will be held on May 2 and 3 whereas for engineering stream it is on May 4, 5 and 7. Both the tests will be held in two sessions i.e., 10:00am to 1:00pm and 3:00pm to 6:00pm. The test will be conducted in 18 zones of which 14 zones are in Telangana and four in Andhra Pradesh. There are 87 test centers in all test zones with 75 used for AM stream and 83 for engineering stream. A total of 1, 47,958 candidates applied for engineering stream and 73,106 registered for AM stream. the Jawaharlal Nehru Technological University-Hyderabad, which is conducting the entrance test has generated hall tickets of 1,47,912 for engineering stream and 73,078 for AM The stream based on the eligibility of the candidates. Candidates will be al- lowed into the centre two the exams hours before commencement of the examination so as to enable them to familiarize with CBT. All the candidates have to carry hall ticket, blue or black ball point pen, filled-in online application form with photo affixed and attested copy of caste certificate (in case of SC/ST category who have not provided the form during online submission). Students appearing for the exams will not be allowed to leave the examination hall till they complete the test. "We have made arrangements for smooth conduct of the exam. The TSCPDCL has been re quested to provide uninterrupted power on the days of the exams. . Centres have power backup facility." Prof T Papi Reddy, Chairman, Telangana State Council of Higher Education, said. To qualify in the TS EAMCET exam, candidates must score a minimum of 25% of the maximum marks. Only such candidates, who have qualified, will be considered for the ranking and will be able to download the rank card. The rank is calculated based on 75% EAMCET marks and 25% boards result. Merit will be decided on the basis of combined score obtained by giving 75% weightage to the marks secured in TS EAMCET and 25% weightage to the marks secured in the PCM in Class XII or equivalent. Lastly the older candidates will be given preference. How to check TS EAMCET 2019 Result? Enter TS EAMCET registration number and date of birth as provided during form filling. The TS EAMCET result 2019 will appear on the screen. Check all the details mentioned in it and download it. Take a print out of the result and keep it safe till the admission procedure gets over. TSCHE will not release the Telangana EAMCET 2019 Ranks along with Results. The TS Engineering Agriculture Medical Common Entrance Test Rank Card will be released after 7 days from the results date. The Ranks will be declared based on 25% weightage of Inter Marks & EAMCET Marks. You can estimate your Rank by checking the Answer Key and Cut off Marks. For counseling, the students need to keep their online Application Form until the end of the admission process. While verification of the documents, they need to provide other documents and admit card to the desired authorities. The official website either the counseling portal will be providing the Information Booklet for TS EAMCET 2019 counseling. dear sir p/s give infermation bipc stream counseling date? sir i got 81.94 in eamcet marks given but show the rank what can i do pl. help me. May I know at what time the results are going to release? Ts eamcet key not available. i am waiting for results say soon.........!